Every now and then, exceptional form and talent come to the fore and combine unarguably, imperiously, to blow away the competition. That’s what happened on Boxing Day last year when racehorse Kauto Star won the King George VI steeplechase at Kempton Park for an unprecedented fifth time. He’s the only horse to have won the King George FIVE times. In his first six years in Britain he competed in 18 Grade 1 races over distances from 2 miles to 3 1/4 miles. He completed 15, winning all but one. His sole 2nd place came in the 2008 Gold Cup to his stable mate, Denman. His official rating of 193 (given after his 4th King George win) was the highest ever awarded to a Steeplechaser. 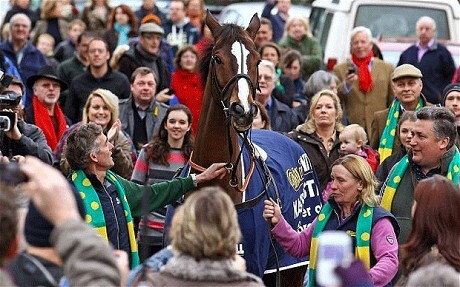 Finishing 3rd in the 2011 Gold Cup, Kauto maintained his record of never finishing outside the top three places in any of his 27 completed races in his 7 seasons in Britain. He’s the only horse to have ever regained the Cheltenham Gold Cup. He’s the only horse to have ever won two separate Grade 1 (or Group 1) races more than four times (Betfair Chase 4 times and King George 5 times). He also won both races under three different Prime Ministers. He has won more prize money than any other National Hunt horse in the history of the sport. He is the only horse to win Grade 1 races in 7 consecutive seasons. He is the only horse to have won 16 Grade 1 races in total. Along with Denman he has competed at the Cheltenham festival 6 times in a row. Thus, Kauto Star is now firmly ensconced in the pantheon of race-horse legends alongside those all-time greats, Arkle and Desert Orchid. But it would be a school-boy’s error to speak of Kauto Star without also recognising that he is part of an extraordinary double act. Ruby Walsh is the jockey who brings Kauto Star’s potential to brightly burnished fulfilment. Walsh is one of the world’s great jockeys and has ridden more than 1,400 winners in a glittering career. At the 2009 Cheltenham Festival Walsh rode a record-breaking seven winners over the four days. On the second day of the 2010 festival he rode Sanctuaire to victory in the Fred Winter Juvenile Novices Handicap Hurdle and therefore became the jockey with the most wins in the history of the Cheltenham festival. Ruby Walsh understands and rides this phenomenal horse better than anyone, and this incredible once-in-a-generation partnership of horse and rider is the key to the mind-blowing statistics. Indeed, Walsh has ridden Kauto Star on 17 out of his 23 wins. And so to the topic of pensions and the successful management of the valuable, yet scarce, assets required to provide adequately for pension plan members in retirement. The tectonic plates are shifting fast in this besieged industry. As it rapidly becomes all but impossible for a lay board of pension plan trustees to navigate the treacherous and volatile markets in which we find ourselves, there is growing demand for a more holistic framework that provides world class strategic advice whilst also managing the assets against the liabilities. Traditionally, those two functions (advice and asset management) have resided in very different places. Strategic investment advice comes from the stable of the investment consultant whilst asset management comes from the money managing fraternity. That functional distinction is, perhaps, no longer fit for purpose. These days, pension plans are asking for something different and better. They want Kauto Star, field beating, world class, asset management AND strategic advice in seamless combination. In other words, they want team work and joint responsibility. How do you get Kauto Star performance? Not without Ruby Walsh. How does Ruby Walsh lift the King George five times? Not without Kauto Star. Perhaps the answer to our clients’ request, is to pull off the previously unthinkable: an unbeatable alliance of the world’s best and most versatile asset management with the finest investment consulting services. The asset manager is Kauto Star. The investment consultancy is Ruby Walsh. The pension plan is the owner. At stake is the greatest prize of all: the on-time delivery of EVERY promised pension payment to the owner’s members. Like the link Dawid, really looking forward to the Gold Cup! Thanks Jerry. Gold Cup should be a cracker!